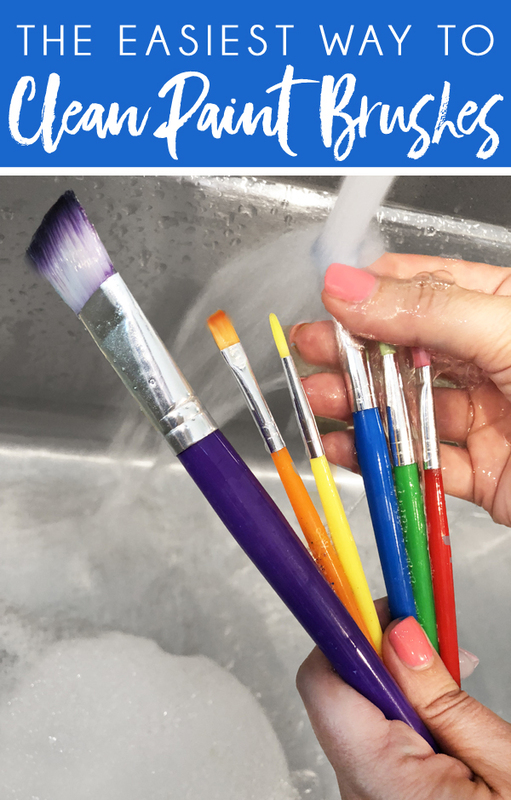 Clean Up After Painting: How to Clean Paint Brushes and Get Paint Off Hands | Blue i Style - Creating an Organized & Pretty, Happy Home! Any day is a good day to paint! 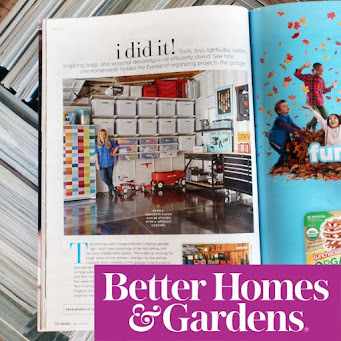 Whether I'm creating art with the kids, painting furniture, or changing the color of your walls, I'm always having fun, but I used to dread the clean up. That is, until I learned a couple of simple tricks that save me lots of time. 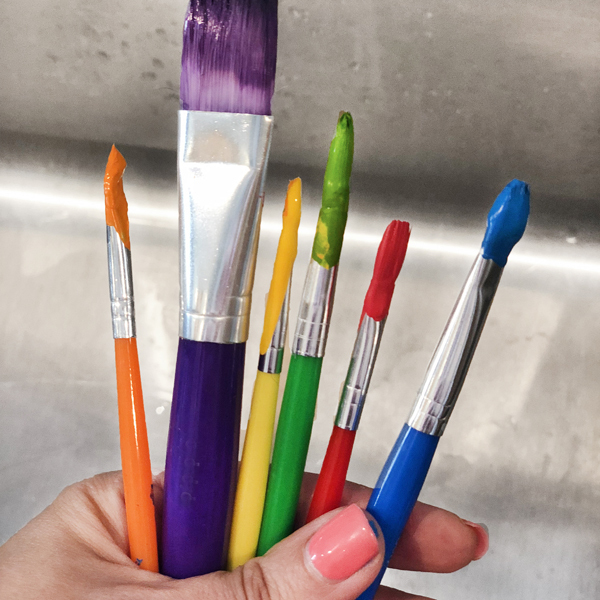 Whether you're using acrylic paint for arts and crafts, latex or oil-based paint on your walls, or wood stain, I'll let you in on my secret for how to clean paint brushes and how to get paint off your hands. 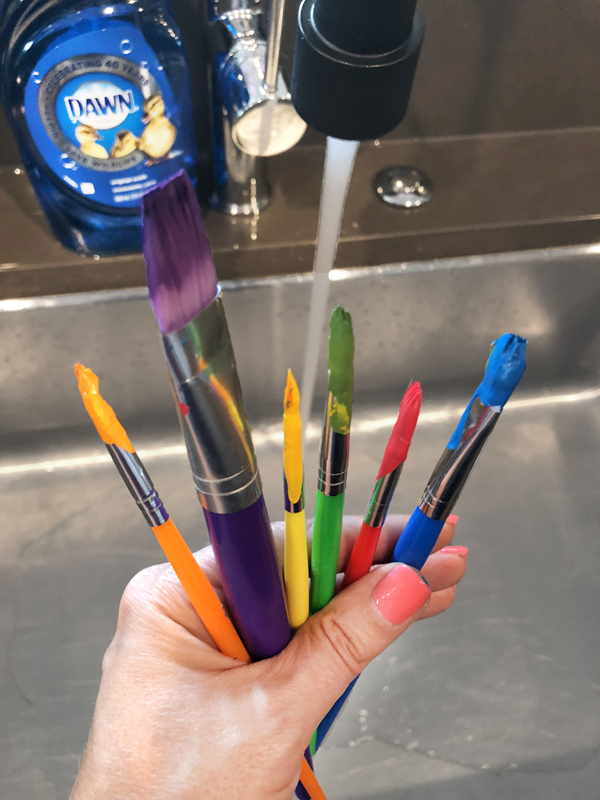 These pretty colored paint brushes were the result of a recent rainy day art project with the kids that all started because Beckett wanted to do the dishes. He grabbed a step stool, pulled it up to the kitchen sink and started "washing dishes," which, in true six-year-old fashion, mostly consisted of splashing around in the water. My default mom reaction was to tell him to stop because he was making a mess. But before I could stop him, he looked me in the eyes and said, "I know it's going to be hard work, but I love hard work," and my heart just melted. A kid's desire to help is such a wonderful quality and I don't ever want to squash his enthusiasm. I decided that rather than stopping him, I would teach him how to wash dishes the right way. This post is sponsored by Dawn, one of my favorite hard working brands, but all ideas and opinions are my own. 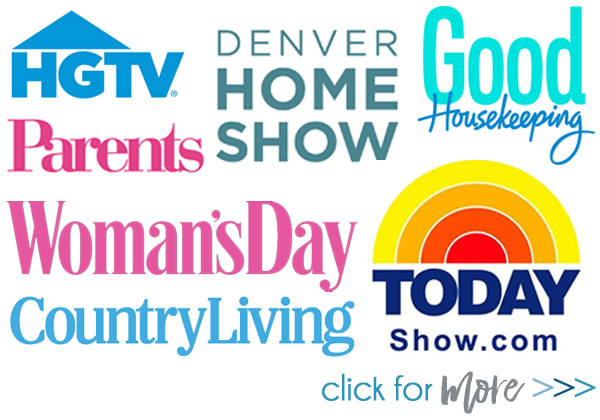 I grabbed out a bottle of Dawn Dish Soap and we got to work on the dishes. Beckett immediately noticed the cute ducklings on Dawn's special 40th Anniversary label, which came as no surprise to me since he loves animals so much. His reading has grown by leaps and bounds in the last few months, and his face lit up as he read the words, "Celebrating 40 Years Helping Save Wildlife." 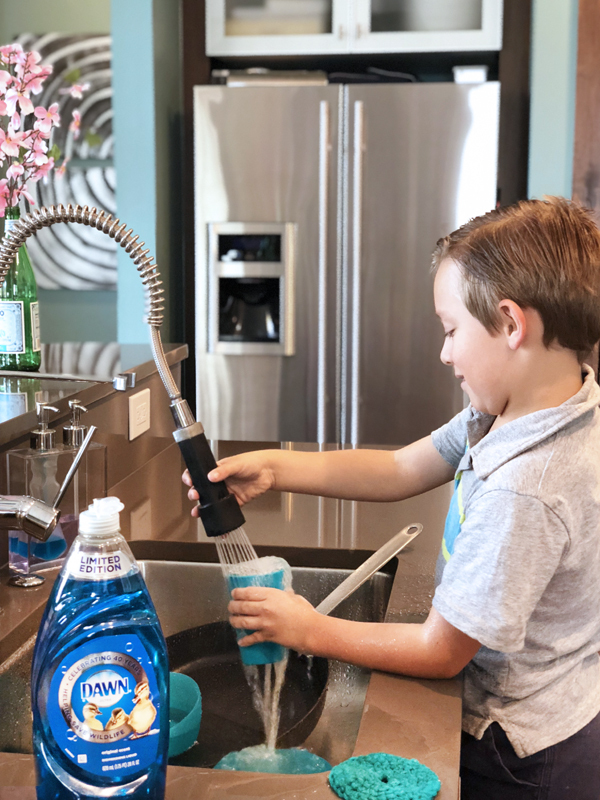 Beckett dreams of becoming a zoologist and protecting animals, so he wanted to know more about how dish soap helps wildlife. While he washed the dishes, I found some pictures online of animals that had become victims of oil spills and environmental disasters, and told him that just like Dawn removes the grease on our pots and pans, it's also gentle enough to clean a bird's feathers. He wanted to know how many animals they had helped, so we read that Dawn has helped save more than 75,000 birds and marine animals, and that Dawn also supports organizations dedicated to rescuing and rehabilitating wildlife when disaster strikes, including International Bird Rescue and The Marine Mammal Center. 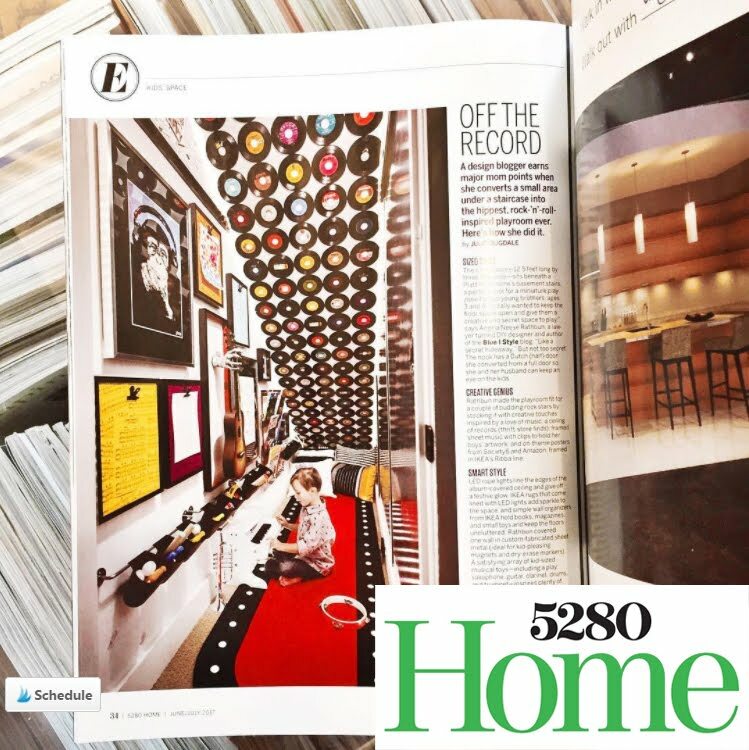 Beckett was over the moon to hear that Dawn cares about animals as much as he does, and this conversation was the perfect opportunity for me to talk to him about the importance of supporting brands that are committed to doing good work in the world. He was fascinated by the idea that Dawn Dish Soap could be used on animals, and he asked me if there is anything else we could use Dawn to clean. I started rattling off a long list of uses. I told him that I always use one specific type of Dawn to remove the set-in grease stains from Dad's shirts. Then I mentioned that I used to take painting classes and the teacher taught us to use Dawn to clean our paint brushes. One mention of art, and Beckett decided he was done with dishes and asked if we could get out his paints! That's my kid, right there! I told Beckett I could do him one better, we could do an art project using his paints AND Dawn dish soap. 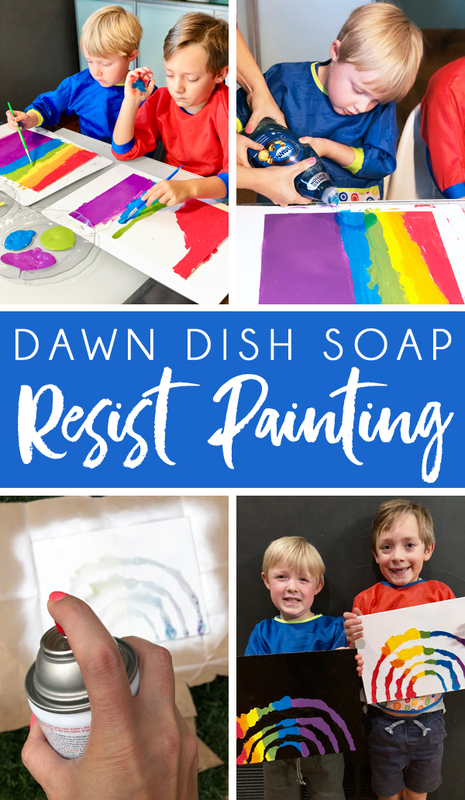 I had seen a YouTube video about how to create a resist painting with dish soap, and I knew the kids would have fun giving it a try. In order for this resist painting technique to work, it's important that you use acrylic paints. 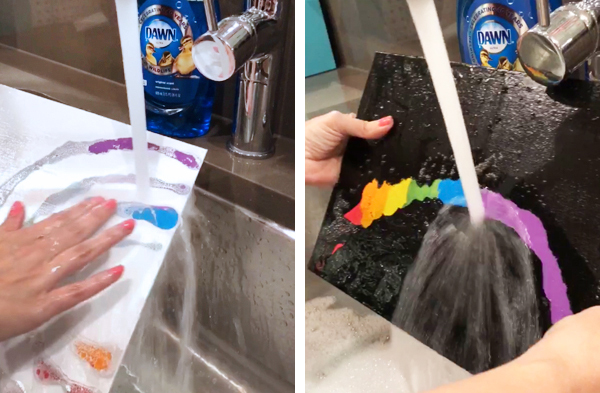 This process will not work with tempera, poster paint, or other washable paints you might buy for kids, because they'll wash right off when you apply water in a later step. 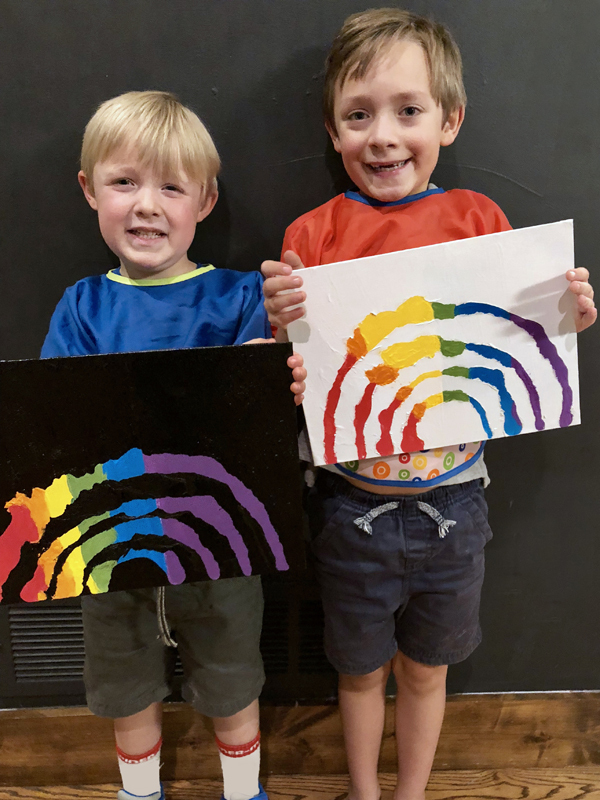 My boys love rainbows, so it came as no surprise to me that both Beckett and Cooper chose to paint their canvases with rainbow stripes. Then they proceeded to also paint their hands, because... well, why not, right?! 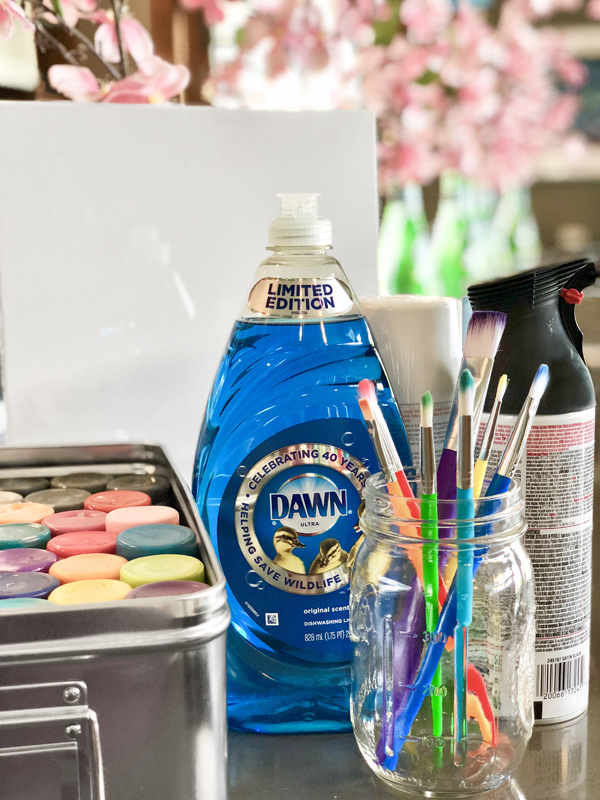 Dawn Dish Soap is as gentle on fingers as it is on feathers, and it's perfect removing paint and grease from your hands. Acrylic paint washes off pretty easily with just Dawn and warm water, but for stubborn spray paint and dried latex paint, you can use a soft toothbrush combined with the dish soap to gently scrub the paint off. Because Dawn is tough on oil and grease, it's effective at removing oil-based paints and stains from hands as well. Washing those little hands was priority one (before they could touch anything), and then I turned my attention to the paint brushes. It's always best to clean paint off of your brushes while the paint is still wet. For wet paint, you'll need nothing more than warm water and Dawn Dish Soap to get the brushes clean. This works for craft paint, latex, oil-based paint, and even stain. Not only is Dawn gentle on the bristles, it's also gentle on your hands, unlike many harsh paint solvents. If you need to take a break between paint coats, or if you don't have time to wash your brush as soon as you finish painting, place your paint brush fully inside a zip-top plastic bag, squeeze out as much extra air as you can, and zip the bag shut. This will keep the paint on your brush wet for days until you're ready to finish painting or clean the brush. The same works for paint rollers. Leave the roller on the frame, and place the entire thing into a jumbo size (2.5 gallon) zip-top bag to keep the roller from drying out between coats of paint. If the paint on your brushes has dried completely, a stronger solvent may be necessary. Methods like acetone and rubbing alcohol can be effective on dried paint, but they will also dry out the bristles, which isn't good for your brushes. After cleaning with solvents, you can counteract the drying effect by giving the brushes a final rinse in warm water with Dawn Dish Soap to moisturize the bristles. Rub the dish soap into the bristles, rinse the soap out, and then reshape the bristles so that they dry in the right position before storing them. 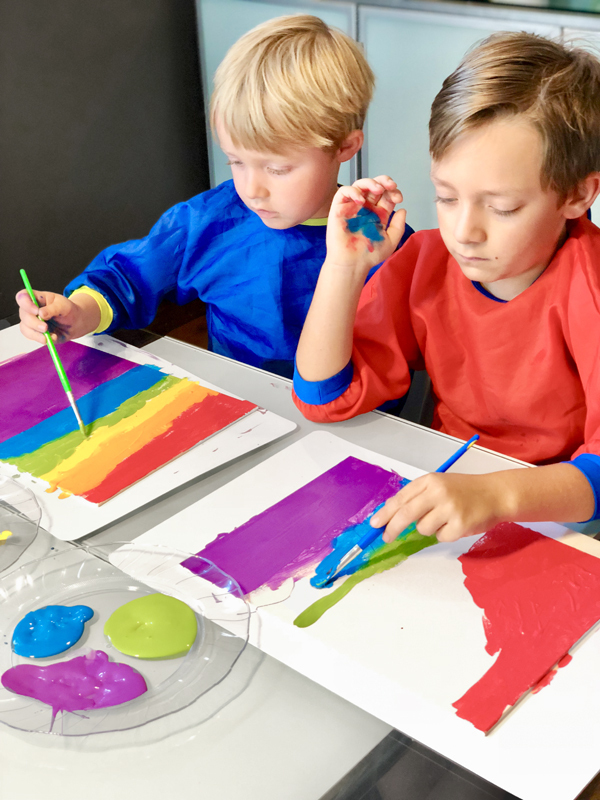 Once the boys' hands were washed, the paint brushes were cleaned, and the paint was dry on their canvases, we were ready to move on to the next step of the art project - drizzling Dawn Dish Soap over the painting. In the example of this project that I saw on YouTube, they used random lines and drops to create an abstract look, but we decided to draw rainbows. Be careful to not get your lines of Dawn dish soap to thick. On our first attempt, the lines spread together, so I simply rinsed the canvas off in the kitchen sink, gently patted it dry, and then we tried again holding the bottle up a bit higher to create thinner lines. 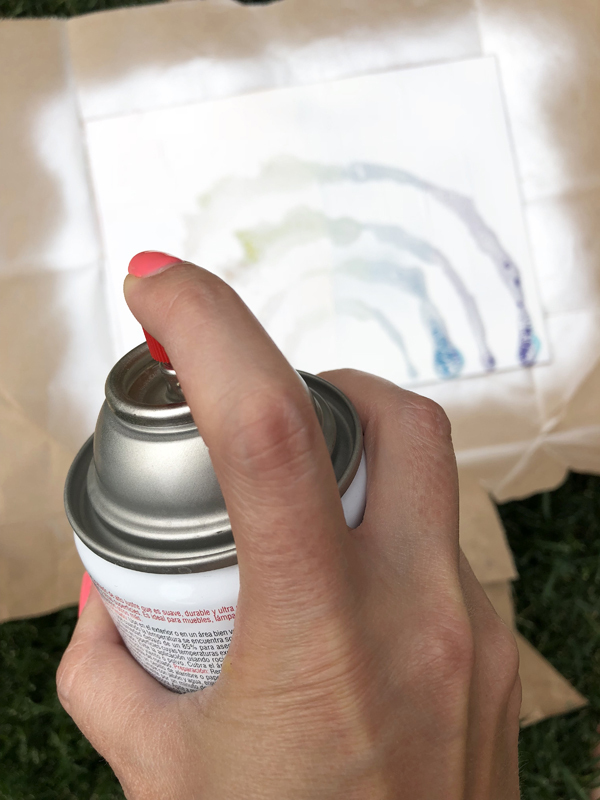 Once you've drawn the design you want on the canvas with Dawn Dish Soap, carry the canvas outside (being careful to keep it flat so the soap doesn't run) and paint the entire canvas with spray paint. 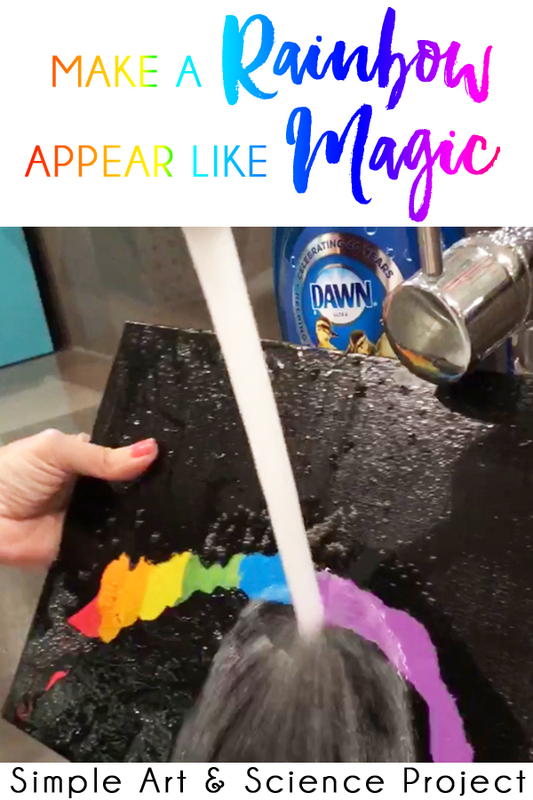 Wherever there is dish soap, the spray paint won't be able to reach the canvas - so these are the areas where the original colors you painted will ultimately show through. Let the spray paint dry for about 30 minutes, or until the paint is dry to the touch. Then spray the canvas off outside with a hose or bring the canvases into the house and run warm water over it in the sink to remove the Dawn Dish Soap. Or at least on the black canvas they did... It turns out I made a bit of a mistake on the white canvas that you should be sure to avoid! We originally planned to paint both canvases black, but Beckett said he wanted his to be white instead. The only white spray paint I had in the house was white lacquer. Everything seemed fine as the spray lacquer went on and I could see the Dawn Dish Soap resisting the white paint. But when I went to wash the dish soap off, I realized the white lacquer had basically created a seal over the top of the dish soap making it hard to wash off. I had to pick it off in place, and it didn't end up quite as clean and nice as the black canvas. But the boys were both still thrilled with their artwork! 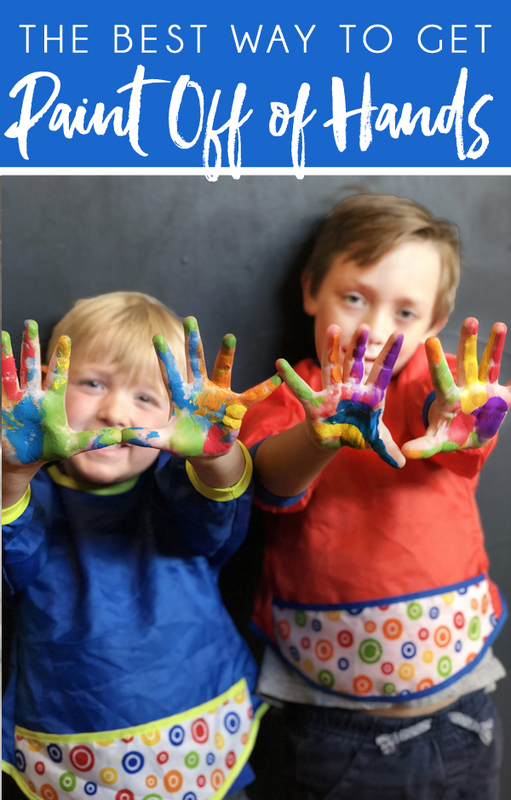 This was such a fun afternoon art project with the kids! 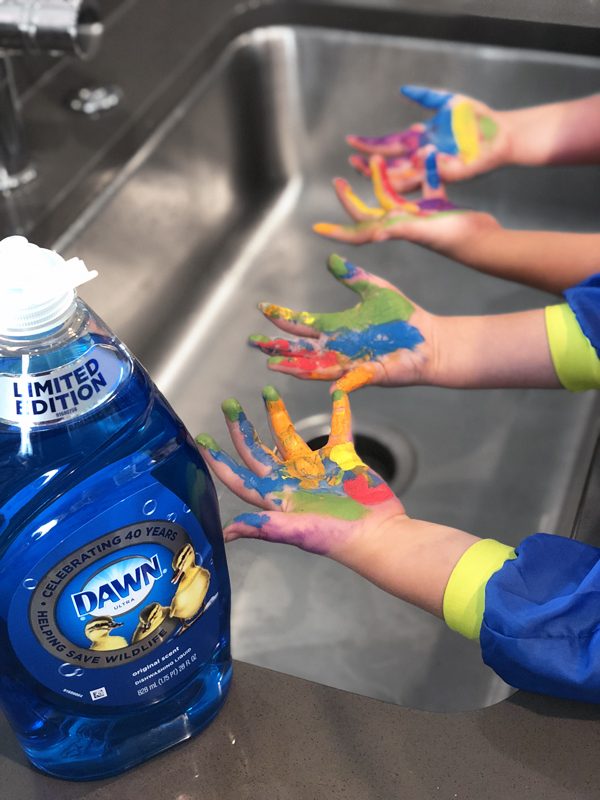 They learned about how Dawn helps wildlife, experimented with a little science in the process of creating resist paintings, and even picked up a new skill as mom's dish washing (and paint brush cleaning) helpers. 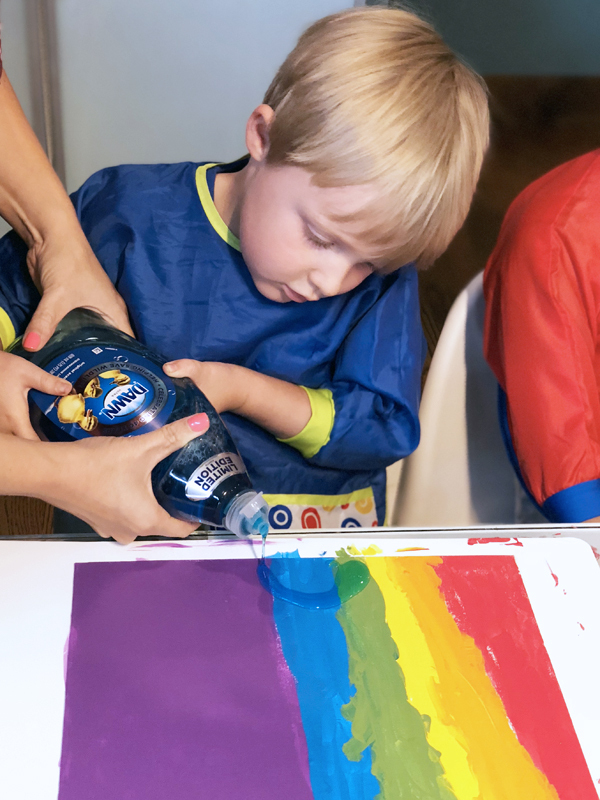 What could be more fun than creating this simple art project with your kids? How about a VIP Wildlife Experience?! Submit the receipt photo here, and complete the registration form for a chance to win an exciting wildlife experience.